"This year's SWAN Prague Festival will feature over 30 women artists from around the world, and every artist will bring something unique . . . We felt there was a need to do something different, to support and promote women artists and creativity while stressing important social issues ." Prague, the beautiful capital of the Czech Republic, has a long history of attracting artists from all over the world, and the Support Women Artists Now/SWAN Prague Festival has representatives from more countries than any other SWAN event this year. The festival includes a month-long exhibition of works by artists from Canada, Russia, Iran, Ireland, Japan, France, Germany, Slovenia, Venezuela, and the Czech Republic. 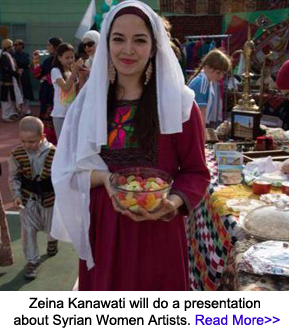 There will also be a film screening, workshops and performances featuring women from additional countries. The festival's excellent website includes detailed information about the schedule and the participating artists in English and in Czech. The ambitious festival, now in its second year, has a terrific line-up that includes both avant-garde and activist artists. For instance, Alena Foustková is a Czech conceptual artist. In one of her previous site-specific pieces, she wrote the sentence "I am normal" over and over on two large gallery walls for four days to make people think about their personal definitions of "normal." Her recent work includes other explorations of tolerance and intolerance in an increasingly polarized society. Maya Petrovna, a London-based artist who will perform in the SWAN Prague Cabaret, says her work is "about live opera meeting circus." She sings opera while performing dances that "often involve elements of contortionism, dragging the audience into surreal mythological settings inspired by avant- garde Eastern Europe mixed with the playfulness of guru Federico Fellini." Christina Maldonado is a Mexican artist who performs "interventions" on old films with stereotyped gender roles. 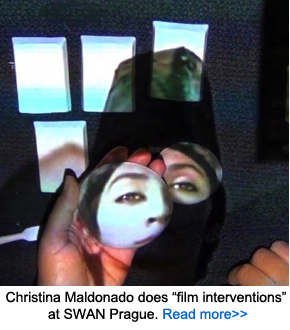 Maldonado has developed a system where audience members can see her hands in front of the image while they are watching the films, so that they experience the strength of a woman artist in real time as a counterpoint to the helpless women they are seeing in the original films. There will also be art that directly addresses social issues. Irish photographer Beth Lazroe will show work about the abuse of women in advertising. When she moved to Prague she noticed that billboards with degrading images of women were everywhere. For many years she has been documenting the problem by taking photos of offensive ads that often dominate public spaces. Her exhibit, "In Our Faces: Visual Assault in the Streets of Prague" has toured and led to widespread discussion of this issue. Zeina Kanawati from Syria will do a special film screening and discussion about Syrian women using art to overcome the heartbreak of war. There will also be workshops about the feminine approach to activism and successful self-presentation for artists, as well as a panel discussion organized by the Prague Film and Theater Center about ways for women artists to gain power through collaborations. A portion of the festival proceeds will be donated to Rosa, a non-profit that helps victims of domestic violence. 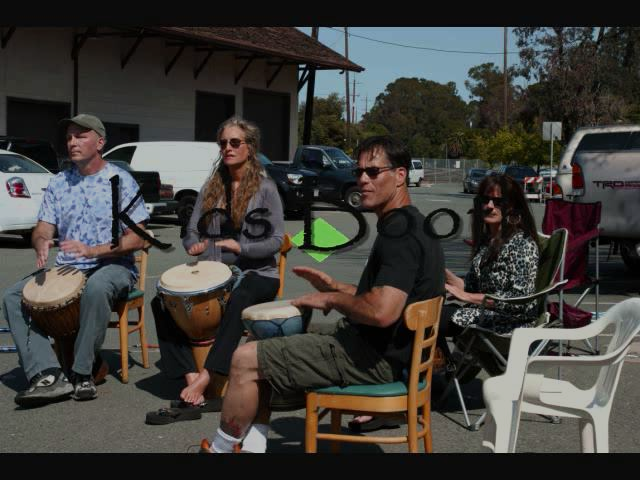 CLICK THE IMAGE ABOVE TO SEE A VIDEO FROM SWAN DAY MARTINEZ 2014! 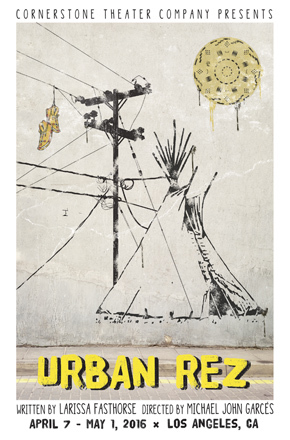 LOS ANGELES, CA - Cornerstone Theatre presents Urban Rez by Larissa FastHorse, an award-winning playwright and choreographer from the Sicangu Lakota Nation. The play explores the challenges of urban Indians who have no claim to their ancestral lands because the federal government declared them extinct. The artistic process began by interacting with indigenous peoples of Southern California and learning about their culture, issues, needs, and aspirations. NEW YORK, NY - Ceres Gallery presents A Moment in Time: Photographs by Jane Stevens. 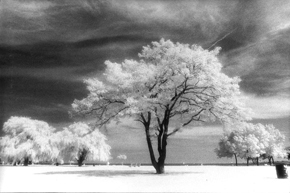 The exhibition features Stevens' black and white photographs that document approaching storms using infrared film.